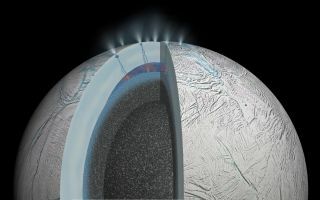 Diagram showing the geysers that erupt from the south pole of Saturn's icy moon Enceladus. New research suggests that Enceladus' geysers are powered by hydrothermal activity. What will NASA's Dawn probe look for at dwarf planet Ceres?